A New Day: I feel completely justified in being unproductive, because I had to work both days this weekend. So there. I feel completely justified in being unproductive, because I had to work both days this weekend. So there. I think this is the cutest picture. From left to right, Me (of course you know it is me! 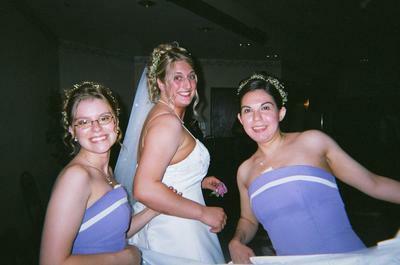 ), Rochelle, and Sabrina (Ro's Maid of Honor). I'm not sure exactly what we were doing right then... but it is such a great shot and shows just how much fun we had on Ro's wedding day. It was a wonderful day (for obvious reasons!!). Oh, and the white things sticking out of the middle of both Sabrina's and my chests are white roses... Lol, don't ask.